Roll out your creativity in any room — sans the mess — with this convenient craft cart. 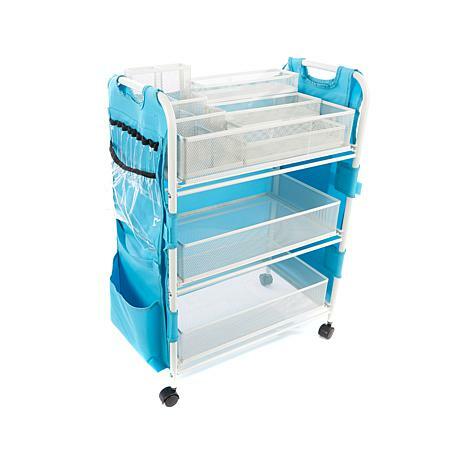 Pockets, drawers, boxes and organizers keep all your supplies at your fingertips, and 4 rolling casters mean you can wheel your cart to your work space, then wheel it back away when you're done. Because your creativity shouldn't be contained to a closet. 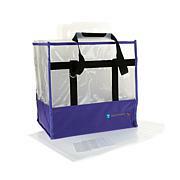 Craft apron is accessory that attaches to the cart and is not intended as a garment for humans. Love this cart. Very well made and holds a ton of stuff. This little cart holds a LOT of stuff! 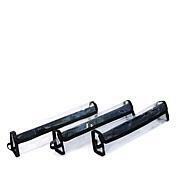 It is short - it will fit under a standard desk/table - but there are many pockets and divider boxes to keep various supplies organized and easily accessible. The wheels turn 360 degrees very smoothly. I don't care for the pen/marker loops on the apron, but that's just my personal preference. The BIG pockets on the back are perfect for my electronic die cutter's mats. 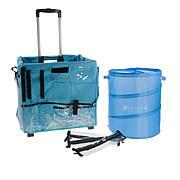 This rolling cart is awesome for scrapbooking or any crafter! You can pack it full of all your crafty stuff and roll it under the table either in your scrap room or at a scrap retreat! 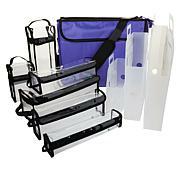 You will want this cart with 3 huge sturdy drawers that pull out for ease of finding what you need! My main reason for buying this cart is to use at my 3-4 day scrap retreats. I had bags under the table full of extra scrap supplies and it wasnt easy to get to and hard on my back. Love this cart so much! This little cart works beautifully under my work table, giving me some much needed, close at hand storage. I love the pull out shelf/drawers. It is so much more efficient to access the items stored on each level. I wish every storage item in my studio was as efficient! This is a great cart. I keep all my painting supplies in this holds all my brushes paint glitter and extra canvases. Recommend highly for any crafter. I am a fan of Totally Tiffany products.